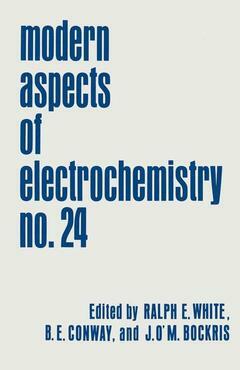 Coordinators: Bockris John O'M., Conway Brian E., White Ralph E.
Integrating both theoretical and applied aspects of electrochemistry, this acclaimed monograph series presents a review of the latest advances in the field. The current volume includes chapters on the mechanism of nerve excitation from an electrochemical standpoint, the electronic factor in the kinetics of charge-transfer reaction, and five other subjects. Electrochemistry of Nerve Excitation, M. Blank. Thermodynamics of Membrane Energy Transduction in an Oscillating Field, V.S. Markin, T.Y. Tsong. Bioelectrochemical Field Effects, H. Berg. The Role of the Electronic Factor in the Kinetics of Charge-Transfer Reactions, E.D. German, A.M. Kuznetsov. Electric Surface Effects in Solid Plasticity and Strength, E.D. Shchukin, et al. Electrodeposition of Metal Powders with Controlled Particle Grain Size and Morphology, K.I. Popov, M.G. Pavolovic. Membrane Chlor-Alkali Process, H.S. Burney. Index.